Home Art+Culture What Are the Most Misspelled Words in Every State? What Are the Most Misspelled Words in Every State? The map, based on data from Jan. 1, 2017, to April 30, 2017, breaks down the most commonly searched “how to spell” words by state, according to Google. 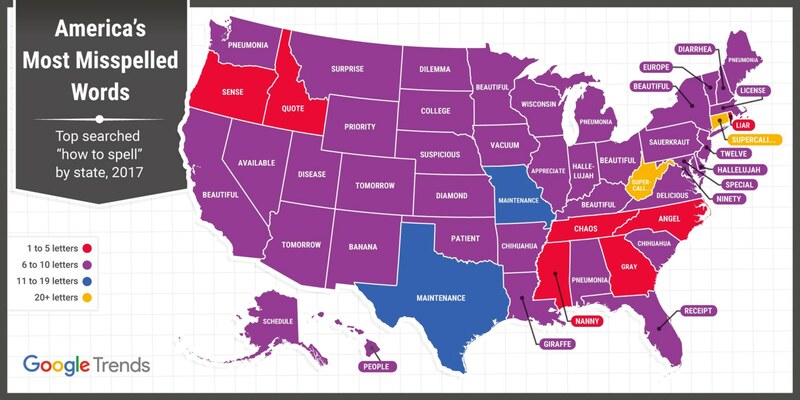 “Beautiful” and “pneumonia” are among the words most commonly searched for spelling across the country, and “sense,” “quote” and “nanny” are the most searched words for spelling in Oregon, Idaho and Mississippi, respectively, the data show. “Tomorrow” is only a search away for residents of Arizona and Colorado, and people in Texas and Missouri commonly wonder about “maintenance,” according to the Google map. However, it appears that the people at Google may need a little spelling help themselves, misspelling “ninety” as “nintey” next to Washington, D.C., on the map before posting a corrected version. Google Trends later made another typo, tweeting, “We will be updating our spelling map from Thursday morning — just in time for the #spellingbee finals! See which states swill change results.” That tweet was then deleted. The Scripps National Spelling Bee is being held at the Gaylord National Resort and Convention Center in National Harbor, Maryland, with the finals beginning June 1 at 10 a.m. ET. Do You Have Good Social Media Etiquette?